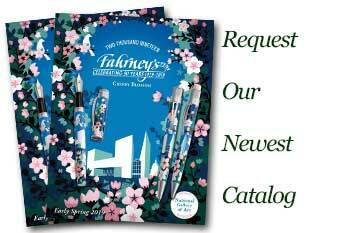 Order your Sheaffer 300 Chrome Cap Fountain Pen today from FahrneysPens.com. Fine Pens, Refills & Luxurious Gifts – great prices & fast shipping. The Sheaffer 300 Series offers a sleek modern design, the ideal accessory for the office. The Sheaffer 300 series features a cigar-shaped profile that is balanced and comfortable to hold and is now available in three new finishes with chrome cap and trim: glossy black, iridescent red and iridescent blue. Each finish offers a sleek modern design and is available as a fountain pen, rollerball and twist-action ball pen with extra-long write out. All come packaged in a luxurious Sheaffer gift box. All instruments feature the Sheaffer signature wide band and white dot symbol of quality. The fountain pen features a stainless steel nib in medium or fine point. Cartridge/converter fill.